A dump truck, right, crashed into a box truck, left, at the intersection of Wones Road and Ohio 47 just north of Port Jefferson. The driver of the box truck, Bruce M. Whaley, 40, of Fairborn, was taken away by CareFlight with serious injuries. The driver of the dump truck, Douglas Winger, 51, of Rossburg, was taken to Wilson Memorial Hospital with head injuries. PORT JEFFERSON — A driver was trapped in his vehicle for an hour following a two-vehicle accident Thursday at 9:06 a.m. at the intersection of Ohio 47 and Wones Road. Bruce M. Whaley, 40, of Fairborn, was taken by CareFlight to Miami Valley Hospital, Dayton, after he was trapped in the box truck he was driving. According to Chief Deputy Jim Frye of the Shelby County Sheriff’s Office, the incident began when the driver of an SUV, who was traveling westbound on Ohio 47, began to slow down to turn north onto Wones Road. Douglas Winger, 51, of Rossburg, who was driving a dump truck, was westbound on Ohio 47 and realized he wasn’t going to be able to stop in time to avoid hitting the SUV. Winger went around the SUV and entered the path of a box truck driven by Whaley, who was eastbound on Ohio 47, just west of Wones Road. The two trucks hit head-on and came to rest in a field. Frye said Winger was out of the truck when emergency personnel arrived on the scene. He suffered head injuries in the accident. It took an hour to extricate Whaley from his vehicle. Whaley was removed from the vehicle at 10:08 a.m., stabilized at the scene and then flown to the hospital. Winger was transported to Wilson Memorial Hospital, Sidney, by Sidney Fire and Rescue. Because of the accident, diesel fuel had to be contained after it leaked from a vehicle. “Diesel fuel sprayed from the dump truck onto the yard,” said Frye. Because there were no streams or waters nearby, the EPA wasn’t called to the spill, he said. 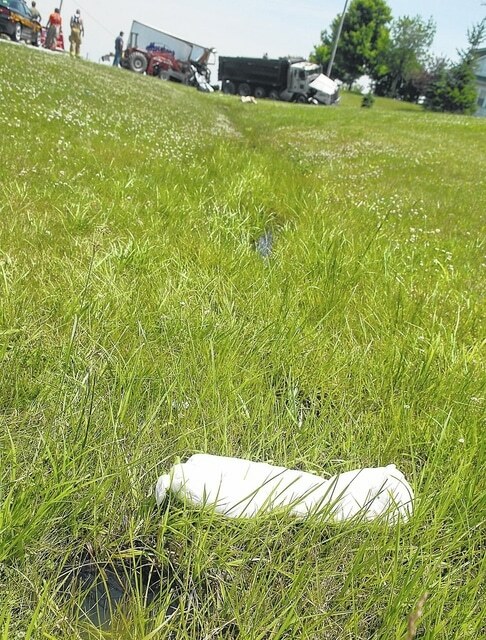 An absorbent boom was laid down to stop the flow of diesel fuel. “An accident re-constructionist was called to the scene to reconstruct the accident,” said Frye. In addition to the Sheriff’s Office, the Anna, Maplewood, Port Jefferson and Sidney fire departments, along with Perry-Port-Salem and Sidney rescue squads were dispatched to the scene. The scene was cleared at 2:48 p.m.